This year too the Salman Khan household will seat a Ganesh idol at their Bandra home during Ganesh Chaturthi, a tradition that is over a decade old and was started by Salman's father, renowned script writer, Salim Khan. Salman Khan’s family like every year shall be celebrating Maharashtra’s biggest festival, the Ganesh Festival in their home. Despite being Muslims, the Khan family is famous for celebrating all the Indian festivals displaying a true picture of National Integration. "Salman's brothers Arbaaz and Sohail and their respective families enthusiastically participate in the festivities. "On the second day, in the evening, the Ganpati idol is taken for immersion nearby Bandstand. The entire family walks along together in a procession," the source concluded. Last year, besides celebrating the festival at home, Salman also participated in the special Puja at the famous Lalbaugcha Raja Ganesh Mandal and donated an undisclosed amount. The officials of Lalbaugcha Raja have confirmed to us that Salman has shown interest in attending a special Puja this year also. 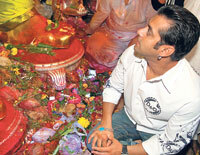 The celebrations at Lalbaugcha Raja last for 11 days and it is not known on which date Salman will attend.